Please sign and return The Sensation Nation Policies and Procedures click here. 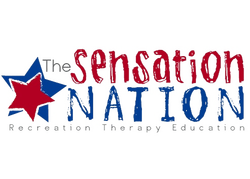 Please sign and return The Sensation Nation Release Form click here. Please read the welcome packet click here. Is there any contraindictions (i.e., medications, activities, foods, etc) that should be avoided? Does your child have a history of seizures? If yes then answer the 4 questions below. 1. When was the most recent seizure? 3. What medication(s) have been prescribed? Does your child receive behavioral intervention (ie., ABA)? Does your child demonstrate inappropriate behavior? If answered above yes then what behaviors? How would you best describe the way your child learns (ie., visual, auditory, cues, etc) ? What, if anything could cause your child to demonstrate self-stimulatory behaviors? What situations, events, and/or types of stimuli could cause your child to have a meltdown? When/if your child has a meltdown, how long does it typically last? Is your child able to organize his or her behavior after a meltdown and return to task? Does your child react to other children in a social setting? In your opinion, does your child get frustrated easily? Frequently? Does your child display mild temperament and self-organize easily? Does your child get excited easily? If yes, once excited, is it hard for him or her to reorganize? Does an excited state often lead to a meltdown?